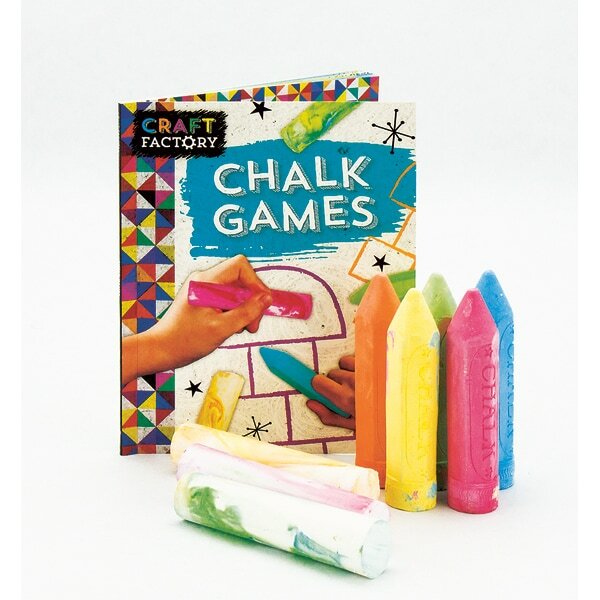 All you need is a piece of chalk, a bit of sidewalk, and one or more friends to play the 11 classic chalk games described in this activity set for youngsters 5 and up. Master favorites like Hopscotch and Snake while learning some new ones, including Numbers & Crosses (a fun and challenging variation on Tic-Tac-Toe) and Pavement Beetle (the chalk version of Cootie). Here too are instructions for Snail Race, Dots & Boxes, King's Corner, Monster's Pie, Heartbreaker, Race to the Star, and Hop the Week. Even better, this kit contains 8 pieces of fat, 4-inch chalk in a rainbow of colors, so you can make your game boards as colorful as you like—or just make your own sidewalk art.